Background: 4-(piperazin-1-yl)-8-(trifluoromethyl)pyrido[2,3-e][1,2,4]triazolo[4,3-a]pyrazine (1) is a small-molecule which demonstrated a sub-nM inhibitory potency toward the histamine H4 receptor (H4R). However, it was found to be mutagenic in an in vitro Ames assay. Metabolic bioactivation of 1 could potentially arise from the piperazine moiety by forming reactive intermediates such as glyoxal, aldehyde-imine and/or iminium ion, which could all lead to genotoxicity. The aim of this study was to investigate bioactivation of 1 to determine the potential causes of the genotoxicity and mitigate liabilities in this scaffold. Methods: 1 was investigated for its genotoxicity in phenobarbital and β-naphthoflavone induced Sprague Dawley rat liver S9 fractions. 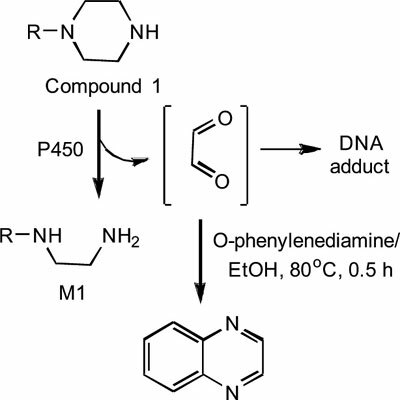 Trapping agents such as o-phenylenediamine was used postincubation. Results: Following metabolic profiling of 1, two oxidative metabolites were observed and identified in phenobarbital- and β -naphthoflavone induced Sprague Dawley rat liver S9 fractions. Metabolic pathway of 1 was primarily mediated by the metabolism of the piperazine moiety. The trapped glyoxal was identified by using high resolution LC-MS instrument. Structural characterization of the trapped glyoxal was determined by comparison of retention time, accurate mass measurement and Collision Induced Dissociation (CID) spectra to authentic standard. Conclusion: In the present investigation, a novel method was developed to trap glyoxal, which may potentially be liberated from piperazine moiety. These findings led to modifications on the piperazine ring to mitigate the bioactivation pathways leading to mutagenicity. Subsequently, the next generation compounds with modified piperazine moiety, retained H4R inhibitory potency in vitro and were not genotoxic in the Ames mutagenicity assay. Induced rat liver S9 fractions, genotoxicity, o-phenylenediamine, glyoxal, quinoxaline, H4 Receptor.